St. Petersburg’s Mikhailovsky Ballet and Orchestra returns with a Center Premiere of the dazzling Don Quixote. 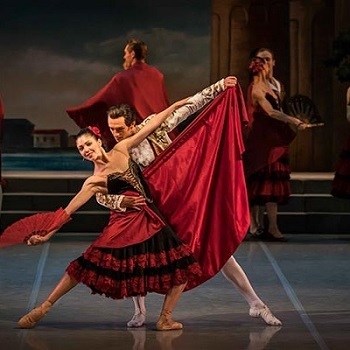 Colorful, vibrant, virtuosic and comical: all apt descriptives for the beloved Don Quixote, but none can fully convey the sense of pure joy that the ballet arouses in the audience. Inspired by Miguel de Cervantes’ sweeping tale of romance and chivalry, the knight-errant of la Mancha, Don Quixote, and his devoted squire, Sancho Panza, are positively heroic when it comes to aiding the spirited village maiden Kitri and her charming amour, the besotted barber Basilio. From the bravura dancing of the fiery toreador Espada to the colorful caravan of gypsies, the stage explodes with one show-stopping performance after another, with gravity-defying leaps and spins in this feast of choreographic fireworks. Ivan Vasiliev, principal dancer with the Mikhailovsky Ballet performs the role of Basilio in the evening performances on Friday, November 9 and Saturday, November 10, and principal dancer Victor Lebedev performs as Basilio in the matinees on Saturday, November 10 and Sunday, November 11. Don Quixote is presented with special underwriting from Connie and Peter Spenuzza. 7dGcwu Some really excellent posts on this site, regards for contribution.